Hi! Enter your email address to subscribe! say, in the ballroom of a seaside hotel. and disappeared in a red cloud of brick dust. whatever it was they were playing. I WENT to my grandfather’s grave today. It’s high up on the side of a hill and to reach it you drive up through secluded streets shaded by large trees and there, between two houses, is a tiny blink-and-you’ll-miss-it lane. It’s so narrow that even if you’re small, you can reach out really, really far and touch the dusty whitewashed walls on either side. As you emerge from the lane you find yourself at the top of a hill, all of Karachi spread out before you; below you grave after grave until your gaze rests at the foot of the hill. That’s a hell of a view, you think, this is a good a place as any to be buried. And imagine what it must look like at night with all those city-lights sparkling under the stars. You pass headstones and shaded tombs and carefully step over mounds — some so heartbreakingly small that you don’t want to think. All of them carry a story. PROF SURGEON H. M. SIDDIQUI says one. EAT WELL, DIE YOUNG, AND HAVE A GOOD LOOKING CORPSE says another. One of the smaller ones has a red bicycle with black handlebars carved carefully into the marble. 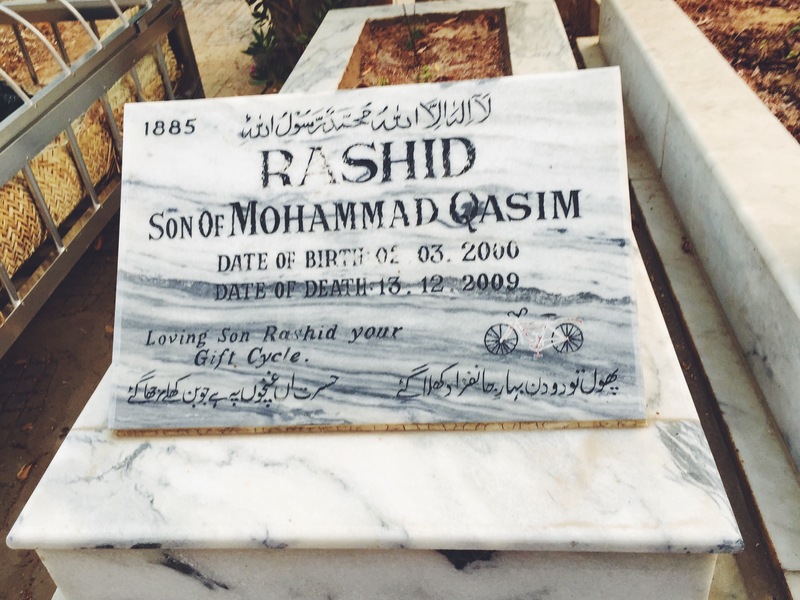 Underneath, in small, neat letters it says LOVING SON RASHID YOUR GIFT CYCLE. 2000-2009. There’s a small staircase that leads down to my Nana’s grave. And there’s a small, white marble bench at the foot of it for visitors. The caretaker comes and washes the grave and then I lay the rose petals on it and say a small prayer. As the caretaker leaves, he tells me how my grandmother came just yesterday. She’s here most days, he says. Sits just there, on the bench, till sunset. He walks away up the staircase. And now I have to sit because my vision is blurry and my legs feel strange and I can smell the rose petals on the sea breeze. And I think of her, sitting here all alone, day in day out, even though it’s been three years, sitting on that bench that looks over Karachi and the grave of the man who spent his whole life with her and I wonder at a loneliness I can not begin to imagine. At the end of his book Contact, astronomer Carl Sagan writes that for small creatures such as we the infinities of the cosmos are made bearable only through love. We need the enveloping arms of those we love, ready to catch us when we grow dizzy from contemplating eternity. And as I lie here on the roof watching Sirius twinkle across the vastness of space and the immensity of time, I realise he knows what the hell he’s talking about. — Translation by my old friend, Yousuf Mehmood.